*Note if they are a member of both of our groups do not sign up on both and use the Strobist site to RSVP to save the 20 seats for non members of my group and and members of TBCC who would like the opportunity. THEY must be registered and their name on the attending list that will be checked at the door as seating is limited and this event will fill. Creative Visualization for Photographers with Rick Sammon! Rick Sammon’s latest book (and 36th), Creative Visualization for Photographers, takes the reader though the complete photographic process – from seeing to shooting to processing. In this talk, Rick will share some of his favorite photo philosophies from this best-selling book. The seminar is free. Rick will have copies of his book on hand to autograph for our members. Rick Sammon, a Canon Explorer of Light, has published 36 paper books, including Secrets of HDR Photography, Exploring the Light, and Digital Photography Secrets. Rick also has three apps on the iTunes store: Rick Sammon’s 24/7 Photo Buffet – an e-book that offers 24/7 access to Rick’s best photo tips, tricks and techniques. Rick Sammon’s Social Media Marketing for Photographers, a series of Quick Time movies that features Rick’s tips on Social Media. Rick Sammon’s Life Lessons We Can Learn From Mother Nature, a collection of Rick’s favorite wildlife photographs accompanied by inspirational quotes. Mini-lessons on wildlife photography are also included, as well as quick Photoshop tips. Rick’s book, Flying Flowers won the coveted Golden Light Award, and his book Hide and See Under the Sea won the Ben Franklin Award. Rick, who has photographed in almost 100 countries around the world, gives more than two-dozen photography workshops (including private workshops) and presentations around the world each year. Rick, who has been nominated for the Photoshop Hall of Fame, is considered one of today’s top digital -imaging experts, cutting through lots of Photoshop “speak,” making it fun, easy and rewarding to work and play in the digital darkroom. When asked about his photo specialty, Rick says, “My specialty is not specializing.” See http://www.ricksammon.com and http://www.dpexperience.com for more information. December Meeting – Competition Awards and Holiday Fun. Our annual awards and holiday meeting will be held on December 17th. 7:00 PM at tRG studio. As always, we will be having a print show – please bring a print to hang and be prepared to talk briefly to everyone about your print. We will be awarding the prizes for the competition winners and we will have a few other fun surprises. Please bring an appetizer, entree, dessert, or drinks to share. We have tableware, cups, ice, and decorations covered already. You may use the following form to let everyone know what you are bringing. This list can be looked at first so that you can see what others have already signed up to bring and avoid duplicates. We also would like a few volunteers to help move furniture and arrange the studio on the afternoon of the 15th. If you would like to assist please let Robert know. We would like your feedback regarding possible topics to present at our 2nd Staurday meetings. Use the form below to indicate your preferences. 1> Our elections were held last month and we want to welcome Lynn Wiezycki and Bryan Schneider to the Board of Directors. The new board is as follows and members will hold office through December 2017. Next elections will be held in September of 2017. 2> Remember to bring your images (10 out of at least 20) that show the progression of a portrait shoot from start to final image to our 4th Friday meeting on October 23rd. 3> If you took photos at our field trip to the winery please bring digital copies to our meeting to give to Michael Stephenson. He will be passing them along to the winery. 4> It’s time to pay dues for 2016 membership. Remember that it’s $30 if you pay in person by December 31, 2015 and $35 after that. It’s $30 dollars if you use the convenient shopping cart option on the website. 6> Mark your calendar for our December holiday meeting. It will be Thursday, December 17th, 7:00 PM at tRG Studio. As always, plan to bring a print (not a digital file) to display and discuss. We will have potluck food and refreshments again. The club will provide ice, cups, plates, eating utensils, and decorations. There will be a sign-up sheet posted here soon. We will be announcing the competition winners and there will be door prizes as well. We will also want volunteers to help prep the studio ahead of time on the afternoon of the 15th. On Saturday, September 12th we will present a video as usual at tRG studio. Subject is yet to be determined as of this posting. Keep an eye out for an email from Chris Volf regarding details as they become available. Michael Stephenson has arranged a field trip for us at the Strong Tower Vineyard & Winery. Starting that afternoon at 3:30 and until closing we will be able to tour the facility, Take photos, and sample and purchase products. Be aware that the owners have asked us to wait until 3:30 to arrive because they will have another group on the premises prior to that time. Many of us have decided that we will go together as a group for a long lunch somewhere in between the video and the field trip. Location is yet to be determined. Mark your calendar and join us for a full day of fun and photography! Just a reminder that this week we are doing something a little different. Please bring 3 RAW images to competition night, in addition to your Night Sky entries. Notice I said RAW. RAW would be untouched in any way. No processing of any kind. And obviously, no jpegs. RAW. Ok, enough of that. This week Robert will be in Colorado, therefore, we will need two judges to work with Jim Sykes. Sure would be nice to have a couple of volunteers. By the way, if you want to be added or removed from our google group, please let me know. Thanks for participating. 6/7/2015. 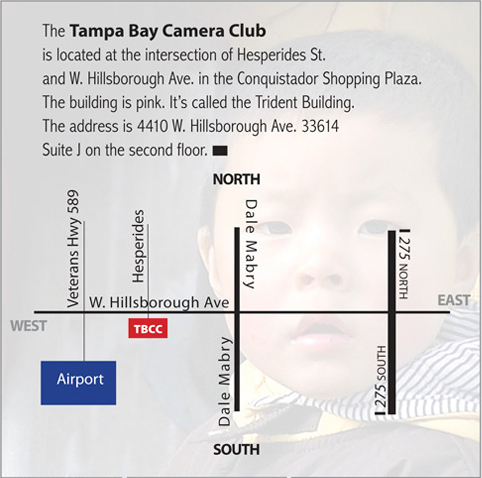 TBCC members, We are going to visit another camera club on June 9th for a 6:30 meeting start. Sun City Camera club would like us to get there early say around 5:30 to meet and greet. The competition starts promptly at 6:30p. The address of 945 N Course Lane, Sun City, Florida 33573 and it came up with a very close location to the Sun City Center Atrium Building. Just a reminder to the group, that there will be no meeting on Friday, April 24, 2015. Our regular schedule will resume next month. Since next month’s topic will be a bit unusual from our norm, the extra time will come in handy to work on your competition entry. The topic next month is, “Fairy Tale Gone Bad”. Get those imaginations firing on all cylinders and wow everyone! Please note that we are changing the date of the event due to the bad weather forecast. We will not be meeting on the 23rd. We will meet instead on Friday, January 30th. At 7:00 PM we will carpool in a few vehicles from the swimming pool parking lot to parking area 5. That is where we will have our meeting. Parking area 5 only accommodates 5-6 vehicles. We will discuss various techniques and tips for night and astro photography and then we will set up our gear and start shooting. In addition to the recommended equipment listed below you may wish to bring food and drinks for the evening.